Rebekka van Leer was born in Smallingerland (Friesland) as the daughter of Leman and his second wife Vrougje van Leer. She was married to Benjamin van Gelder, one of the nine children of Aron van Gelder and Roosje Sax. Aron was one of the colourful Jewish market vendors. He made his presence very much felt at the weekly market in Meppel. He was also feared because of his letters to the editor in the Meppeler Courant. He also acted as Saint Nicholas, riding on horseback (he had served in the cavalry) through the streets of Meppel on 5 December. 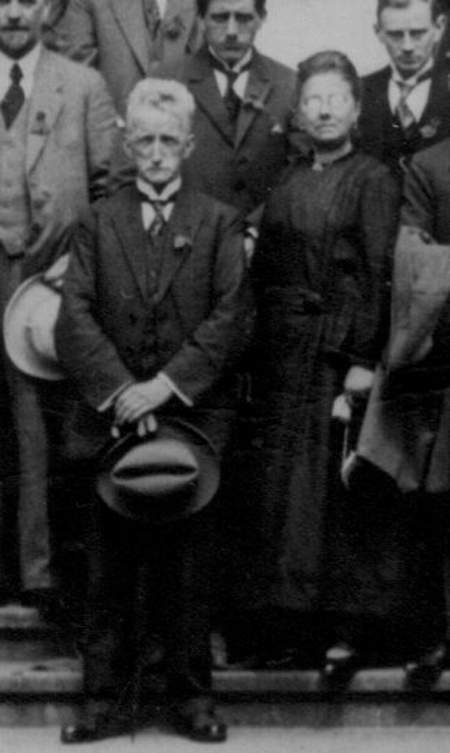 Benjamin and Rebekka van Gelder. Benjamin was the eldest son of Aron and Roosje. He was born on 24 Januari 1879 and married Rebekka who was born in Smallingerland. Like his father Aron, Benjamin and Rebekka had many children: Anna Regiena, Aron, David, Eliazer, Leman, Rijna Elizabeth, Vogelina and Rozetta. The Van Gelder family first went to live at 21 Hoofdstraat, where they had their shop. In 1932 they moved to 7 Prinsengracht and in 1935 they settled at 23 Parallelweg. Benjamin started as a merchant of fruit, smoked fish etc. and settled in the Hoofdstraat opposite the town hall. Shortly afterwards, in 1910, he made over his business to Benjamin Frank, the son of a rag-and-bone man who also sold 2nd hand goods. Benjamin himself started selling old books and antiques. He used to do this in cooperation with Luuk Schippers, nicknamed the ‘kale student’. He got this strange name because he was a greengrocer in Woldstraat and walked smartly dressed, even wearing a hat, behind his greengrocer’s cart. On Sundays, Benjamin had a sweet stall in the football field of MSC on Weerdstraat. He kept selling fruit, though. Kids from the neighbourhood remember that in spring and summer he would put out the crates of fruit on the pavement. One of his children served the clients. Eli and David van Gelder on a postcard printed from a photograph. Benjamin had a great sense of humour. Even on 23 August 1942, in the middle of the war, and although three of his sons had been carried off, he reported to the police that ‘[…] Christian boys had stolen Jewish plums from his garden and that he feared they would be contaminated.’ He enjoyed this sort of joke very much, so did the police. His impulsiveness caused problems quite often. Before the war, the broadcasting corporations had their meetings for members in summer. In the evening one could often see big coaches entering Meppel with the name of the corporation on them. One Sunday evening some VARA busses stopped in front of Café Pluis (now Gruppen )on Parallelweg. The passengers got off and when they had nearly all entered the café, Benjamin, who then lived next to the café, shouted: ‘Guys, you should not be here, the VARA building is in Brouwersstraat!’ They all got back into the coach and departed. Evidently, Benjamin and his neighbour were no longer very good friends. When the publican was outside Benjamin did not have the courage to pass by unaccompanied. Opposite us lived the Van Gelder family, who were fruit sellers (nowadays the painting business of Seydell has a workshop there). The garden used to be the orchard and vegetable garden of Aron van Gelder. When the pears were ripe Van Gelder called the kids in the neighbourhood and threw pears for us. My sister went to the Zuider School with Betsy and David; I was friends with Rijna and Liny. When they were no longer allowed to attend the school in Meppel, they went to Zwolle one day a week. We played with them as long as was allowed, because the Germans forbade it at a certain moment. We just could not understand why they were carried off just like that. We could no longer play as carefree as we used to and we often talked about Rijna and Linie. Later the Koch family came to live in the Van Gelder house. We hardly dared to enter the place. It was very strange and scary. In spite of their being poor, we always had great fun and we played there with great pleasure. Unforgettable! Social evening of the residents’ association Kraton and Surroundings. 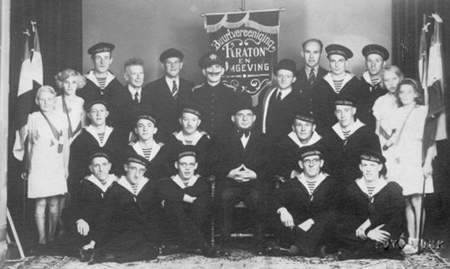 Aaron van Gelder (front row, 2nd from left) and Eli van Gelder (middle row, far left) were there. The tragedy occurred on 3 October, when Mr. and Mrs. Van Gelder and five children (Anna, David, Rijna, Rozetta and Vogelina) were evicted from their home. 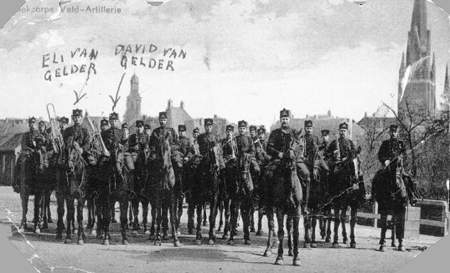 This is the moving story of Jacob Dekker from Ridderkerk. In my form was Ferdie Vonk, the son of photographer Vonk. We often played at Ferdie’s place on Parallelweg, both in the garden and in the studio, a wooden building in that garden. The Van Gelder girls Reina and Vogelina also played there. One of them was of my age. They were dark haired and they lived next door. I will always remember the shock I felt when the Van Gelder house was suddenly empty, that the girls were no longer there. My mother told me that all Jews in Meppel had been carried off to the East by the Germans. We hadn’t a clue what Jews were. In my eyes they were just like the other kids and I did not see why they had to be taken away. I will never forget the mess in their house after they had been evicted. We played there and I can still see the enormous amount of paper on the floor. The front door was sealed, but according to me the backdoor was still open. Finally I would like to say what came into my mind, when in 1993 we visited the extermination camp Auschwitz-Birkenau. My first thought was when I saw the platforms and the ruins of the crematoria:‘The Van Gelder girls did not have to walk very far’. Probably a very odd thought in that situation. It is most remarkable that two of his children married during the war. Rozetta married Mr. R. Montezinos from Amsterdam on 26 January 1941. Leman married Martha van Zuiden in Zwolle on 21 July. Shortly afterwards, on 17 August, Aron, Leman and Eliazer van Gelder were transported to the work camp at Linde. After one day they were taken to Westerbork. Aron and Eliazer left Westerbork as ‘volunteers’ for Auschwitz on 24 August and were murdered there on 30 September 1942. Evidently, Leman did not report as a ‘volunteer’ and stayed in the camp for a considerable time, at first alone and from 3 October onwards together with his wife. He must have seen his parents, sisters and young brother for a while, until they were transported to Auschwitz on 9 October 1942. Eli and Zetta van Gelder (mid-1942). Aaron and Annie van Gelder (mid-1942). There are still three postcards, sent by Leo, as he was called by his relatives, from Westerbork. Writing was difficult, as there was only one ‘writing day’ a fortnight. From these postcards we get some information about his and his wife’s situation. The most important thing is that we are alright. We are lucky we can get parcels here. They are a real help, but under the present circumstances, which you will understand, we do not get many parcels any more. My wife [Martha, T.R.] left hospital this week. She has been suffering from appendicitis for five and a half weeks. She feels reasonably well, although she is in pain every now and then. Bram and Mimi [Roos, T.R.] are also still here. We both work in the kitchen and sleep together. We could not write to you before, as we only have one writing day in two weeks. Of course we had to write a letter home first or to my mother-in-law. As they are no longer there, we could send you a letter at last. Could you supply us with two pairs of goggles? Not sunglasses, but those motor cycle glasses. It’s very dusty here, so that we always have our eyes full of sand. If you can manage to buy them, please send them and tell us how much they cost. We will send you the money (…) Those Meppel football players are no longer very good these days. That is because the best players work in D. [Germany, TR], that is the case anywhere now (…) You’d better not enclose letters in the parcels; they are taken out and read first. I send this letter in secret. That is why I can write so much. Probably the last sign of life, written on 7 May is not from Leman, but from Martha van Gelder-van Zuiden. Leo has no time to write this time, so I write as your unknown niece. Bram is in hospital with cartilage trouble in his knee. Mimi has to stay in bed with a sore throat. 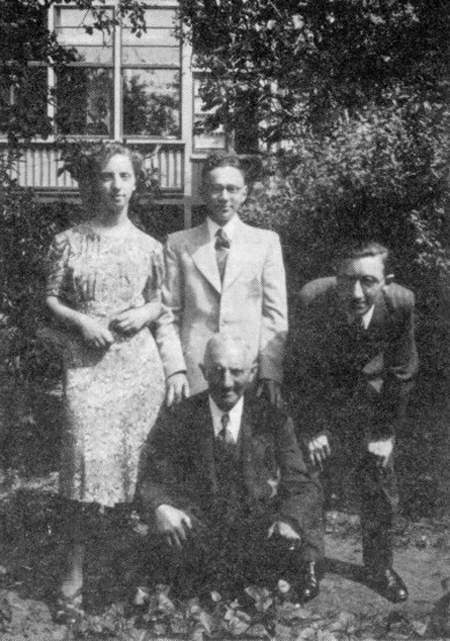 The last picture taken of Benjamin van Gelder (in the foreground) and (standing from left to right) Roos van Gelder, Meijer Frank and Aaron van Gelder. On 18 May 1943 Leman and Martha were dispatched to Sobibor, where they died on 21 May. Like many others they died three days after they had left Westerbork. The Germans were very methodical! After the whole family had been carried off, their house on Parallelweg was sealed off. Shortly afterwards the furniture and other goods were fetched by a transport company and with the help of the Meppel police they were stored in the synagogue. In 1943 the house was let to the Koch family, a business relation of photographer Vonk nextdoor. After the war, kids who were playing in the attic found some carefully wrapped up goods from the synagogue. Benjamin had probably tried to put them in a safe place before they left. 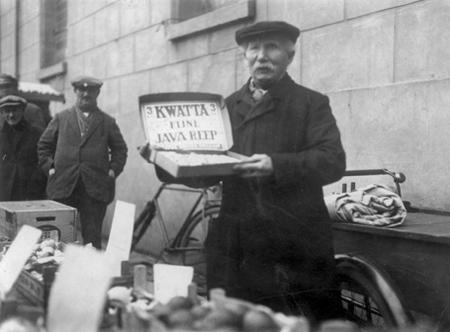 The goods were handed over by the Koch family to Jacob van de Rhoer, who was committee member of the Israelite Community in Meppel. The Van Gelder home on Parallelweg.